NGC 1808 is a barred spiral galaxy of some 35,000 light-years across, located about 40 million light-years away in the southern constellation Columba. NGC 1808 is undergoing so much star formation it has been deemed a starburst galaxy. The galaxy is moving away from us at 995 kilometers per second. NGC 1808 is distinguished by a peculiar and complex nucleus, an unusually warped disk, and strange flows of hydrogen gas out from the central regions. The galaxy’s center is the hotbed of vigorous star formation. The starburst must be at least 50 million years old, and can be no older than 100 million years old. Star formation has been rapid and continuous. Without an influx of fresh molecular gas into the central region, the star forming activity can only be maintained at this rate for another 6 to 20 million years. NGC 1808 is called a barred spiral galaxy because of the straight lines of star formation on both sides of the bright nucleus. This star formation may have been triggered by the rotation of the bar, or by matter which is streaming along the bar towards the nuclear region (feeding the starburst). Filaments of dust are being ejected from the core into the galactic halo by massive stars that have exploded as supernovae in the starburst region. The outer spiral arms of the galaxy are warped with respect to the inner arms (which display a prominent dark dust lane). 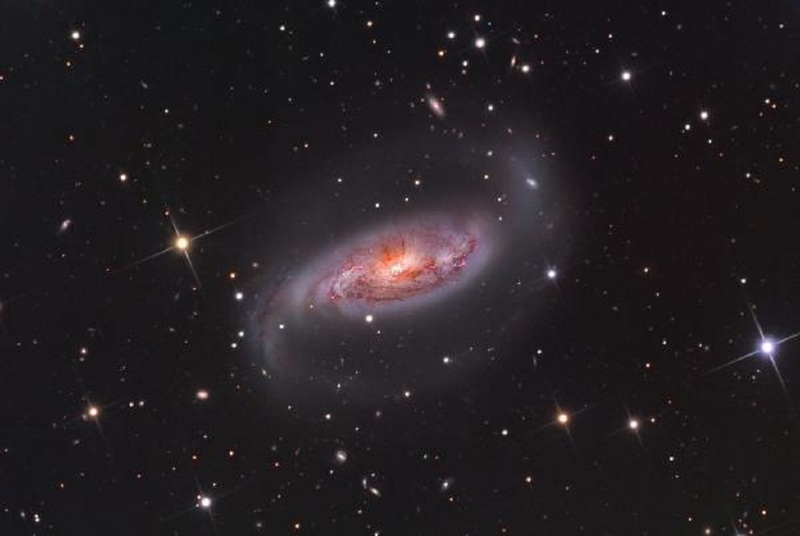 This is evidence that NGC 1808 may have had a tidal interaction with the nearby galaxy NGC 1792. Such an interaction could have created the bar morphology, and hurled gas towards the nucleus of NGC 1808, igniting the exceptional burst of star formation seen there. Stars are often born in compact clusters within starbursts, while dense gas and dust heavily often obscures these starburst region. In NGC 1808 are star formation regions in the bar and also many young star clusters in the nucleus of NGC 1808. The nucleus of the galaxy show two maxima. Either the galaxy has two nuclei (from a previous merger), or one of the dusty filaments happens to bisect the nucleus along our line of sight. NGC 1808 is also a prominent radio source. The radio emission is produced by supernova remnants, of which supernova 1993af has been observed.